I remember reading the first book last year during english class. We were playing bingo and I won some skittles as well as the honor of being the first person to win that semester, needless to say, Body Finders was amazing. 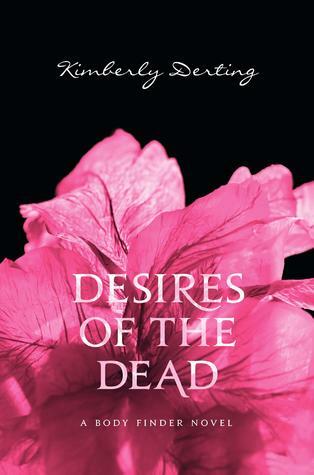 So when I picked up Desires of the Dead I was expecting some awesome stuff, and awesome stuff I did find. Before I begin, let me say that I love Jay. I could tell there was some potential with Rafe going on, but I love Jay to much to even consider it. When I first started reading it, I thought it was going to turn out like Blue Moon, by Alyson Noel, a book that I hated to the core. Some guys becomes friends with her boyfriends and messes up her life, blah, blah, blah... thankfully, it was nothing like that, well, it sorta was, but it wasn't bad. The book is filled with just the right amount of romance and mystery to keep you on the edge of your seat. I seriously had a hard time putting the book down when I got into the thick of it. However, there were some major parts of the book that I didn't like. Even though I feel like I know Violet really well, and Jay and Chelsea almost just as well, there's very little space in this novel to expand on other characters. Sure there's Mike and Megan, and their dad and everyone else in their group, but I felt like they were just there, their characters weren't as strong as I would have liked them to be. Also, I had a hard time believing her parents would be that chill. I mean, I know this is fiction, but really? I think out of all the new characters introduced in the book, Sara Priest is the most interesting and seems to have the most potential in the forth coming books. Overall, even though I really liked the new mystery and romance between Jay and Violet, it didn't exceed my expectations nor it didn't disappoint them either. Despite its flaws, it's a great read and worthy sequel of The Body Finder.